Time to leave Palermo. Fortunately, I’m feeling much better. Unfortunately that was not true for Shirley and Owen, who had to stay behind. Believe it or not, the three of us had different ailments, with Shirley the worst off, suffering from a kind of flu. We made the most of our drive to Mazara, first stopping at the lovely little hilltop town of Erice. This was definitely not a drive I would have wanted to attempt at night, or after having a glass or two of wine. See that light brown squiggle ? It really IS the road. Check out those hair pin turns. Anyone prone to carsickness would be wise to bring along Dramamine. If you are not a sufferer, the views are great! 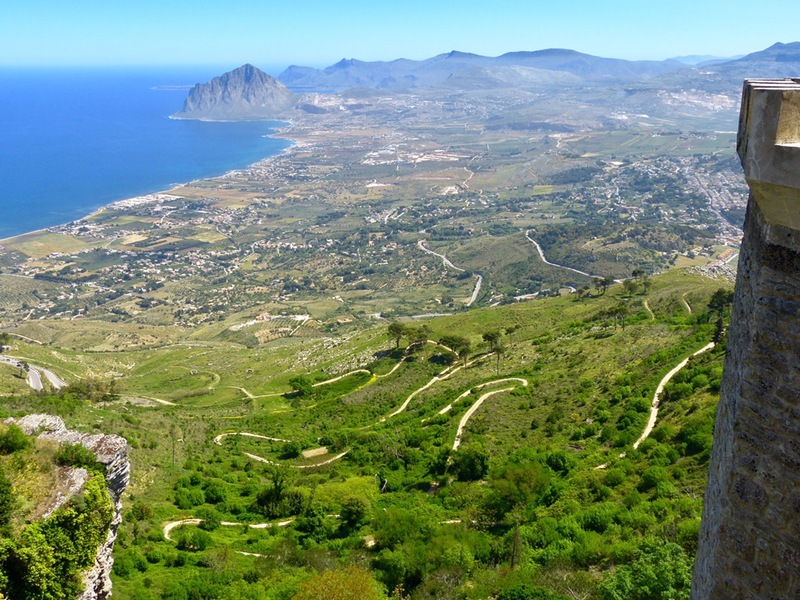 Erice’s castle (pictured in the header) supposedly was built atop Venus’ temple. Legend has it that this temple was the home of prostitutes. That seems fair, given that Venus was the goddess of love and fertility. Back in the day, I’ll bet a visit here was a lot more fun than visiting those vestal virgin temples in Rome! 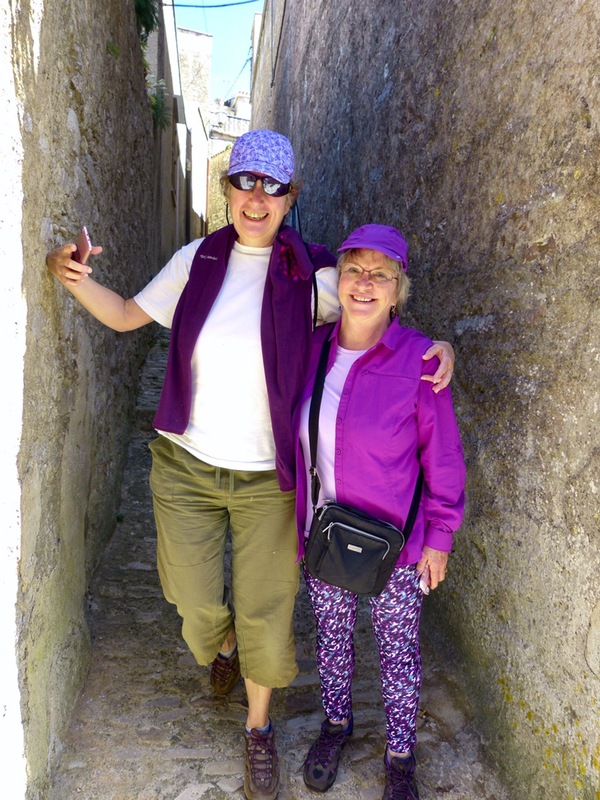 In addition to the castle, Erice has the usual abundance of stone churches (more than one would expect the inhabitants would need, but that’s true of about every town in Italy), and lovely little alleys. 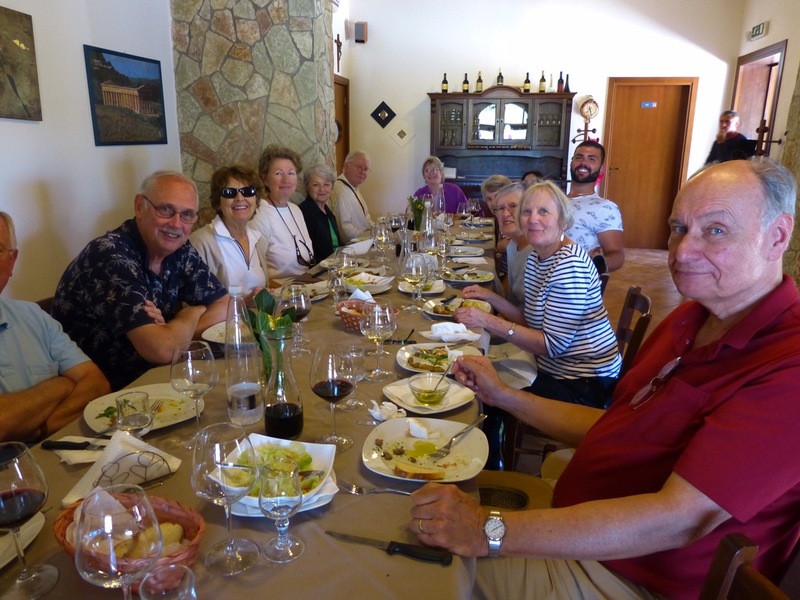 About our group–once again, we lucked out with great, congenial travelers. There are 16 of us–6 men and 10 women from all over the USA. 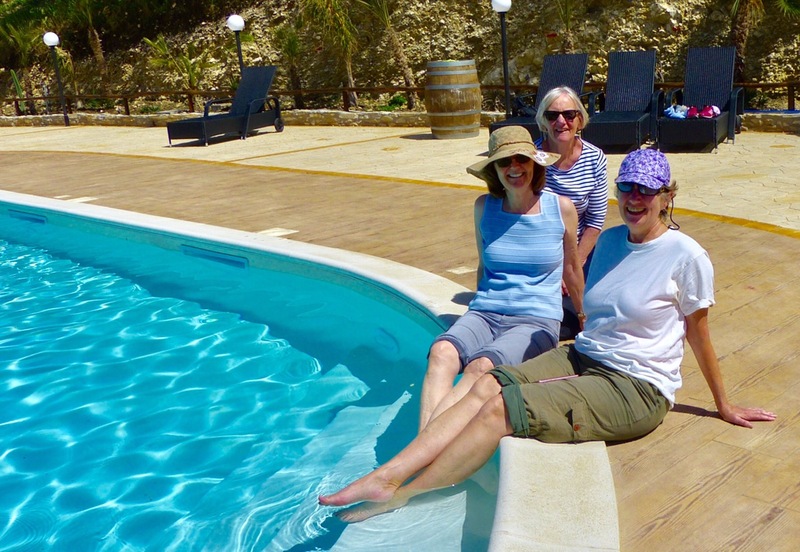 We are four married couples, two sisters, two friends, and four solo travelers, all curious, friendly and open to adventure. But maybe that’s just the type of person who normally signs up for OAT trips. 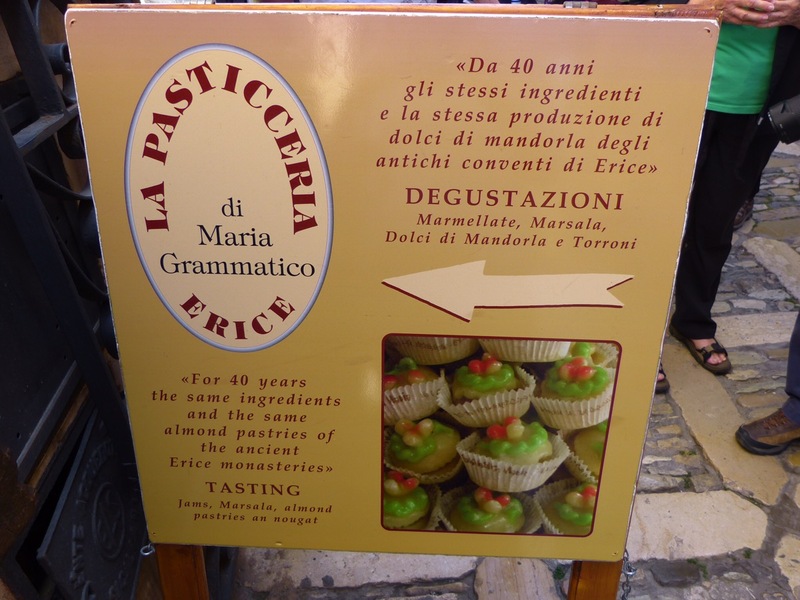 Erice also has a wonderful attraction that Rick Steves highlighted on one of his shows (thank you, Janet C.) and that Daniel, our trip leader, made sure we experienced–the pastry shop of Maria Grammatico. Here’s Maria’s story: her mother was unable to feed her 6 children, so at age 11, Maria was shipped off to the convent, where she was immediately put to work. During her 16 years there, she learned the trade, then set out on her own, duplicating the age old recipes. It seems that the good sisters were not overly supportive of Maria’s efforts, but she persisted, and now has a very successful business, with great ratings on trip advisor. 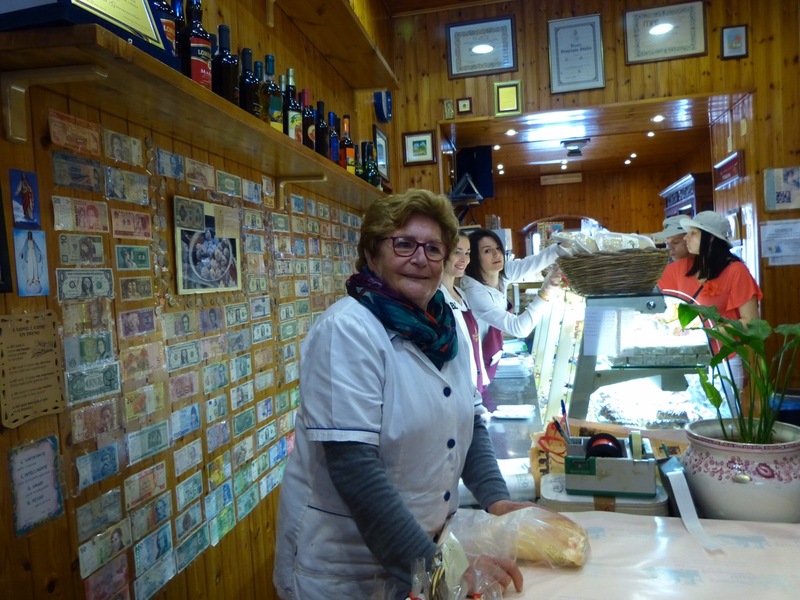 After hitting all of Erice’s highlights, we hopped back on the bus for a fantastic lunch at this amazing location. 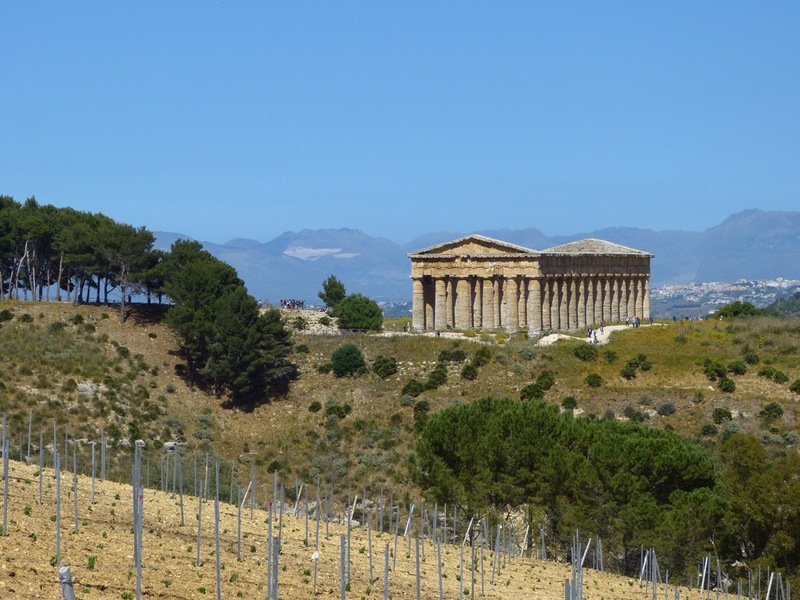 All of the food and wine we enjoyed were from the farm, but what else made the location special was its proximity to Segesta’s temple. If you are ever in the sea, be sure to stop at Azienda Agrituristica. The food is incredible and the scenery is spectacular. Unlike Venus’ temple, you can actually SEE this one, and what a sight it was! Most of the group viewed the temple on a hike from the Agritourismo to our bus. Some of us, however, decided to take the shuttle van back, stopping for a photo op along the way. I leave it to you to decide which option I chose, but here’s a hint. Now in Oslo. Snow earlier, now 40 and raining! I’m so sorry, Janet. Hope the weather changes for you.